The restoration and preservation of Alabama’s lighthouses was brought to a halt for almost a year because of the Deepwater Horizon oil spill in the Gulf of Mexico in 2010, and one member of the Alabama Lighthouse Association (ALA) reported difficulties in securing recovery money he says is necessary to preserve two of the state’s lighthouses on the Gulf Coast. The ALA finance chair, Capt. Hal Pierce, estimated the association lost approximately $96,500 in funding following the oil spill. Pierce said coastal Alabama’s two lighthouses, Middle Bay Lighthouse and Sand Island Lighthouse, were the first two places in the state impacted by the spill. Regular maintenance to the lighthouses is important because of the constant damage by weather. Information provided by Pierce shows the ALA suffered losses in five ways. Time is a factor because of the age of the lighthouses and the threat of storms in the gulf. Many of the ALA’s volunteer workers were diverted after the oil spill to areas involving mitigation activities. Before the oil spill, the association transported approximately 25 workers by boat to the lighthouse on workdays. The association also lost vessels during the 14-month closure, as its boat was utilized for mitigation activities. During the 14-month closing, Pierce estimated lighthouse volunteer hours could have been as high as 3,000 with a $31,200 loss in manpower, a $26,500 loss in vessels, $32,500 in equipment and materials and $6,400 in funding for a total loss of $96,500. Pierce said the estimate is low and it will take the association years, and probably more money, to make up for the lost time. Pierce said he made at least 25 visits to BP claims offices attempting to get an answer about whether or not the ALA could make the $96,500 claim. Once he was told the ALA would be audited, which he thought was a good idea, but he said he never heard back about the results. The ALA’s status as a 501(c)(3) nonprofit made its attempt at a claim more difficult, according to association president Dan Dealy. 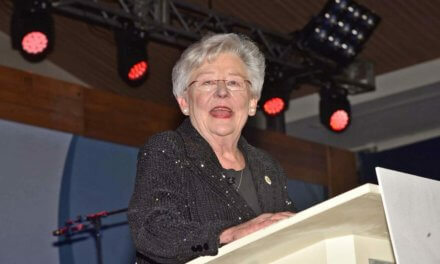 Dealy said the association is considering submitting a proposal the Alabama Gulf Coast Recovery Council, which is responsible for disbursing the state’s $599 million in RESTORE Act funds with a focus on Mobile and Baldwin counties. Dealy said there are approximately $160,000 in needed repairs to the railing at Middle Bay Lighthouse, which the ALA may submit for funding. The ALA recently received approval from the Alabama Historical Commission (AHC) to host a wedding at Middle Bay Lighthouse, with a handful of stipulations that absolved the ALA and AHC of any liabilities should the wedding partiers be injured at the site. Dealy said the wedding went well and opened the door for the possibility for more revenue-generating activities at the lighthouse. 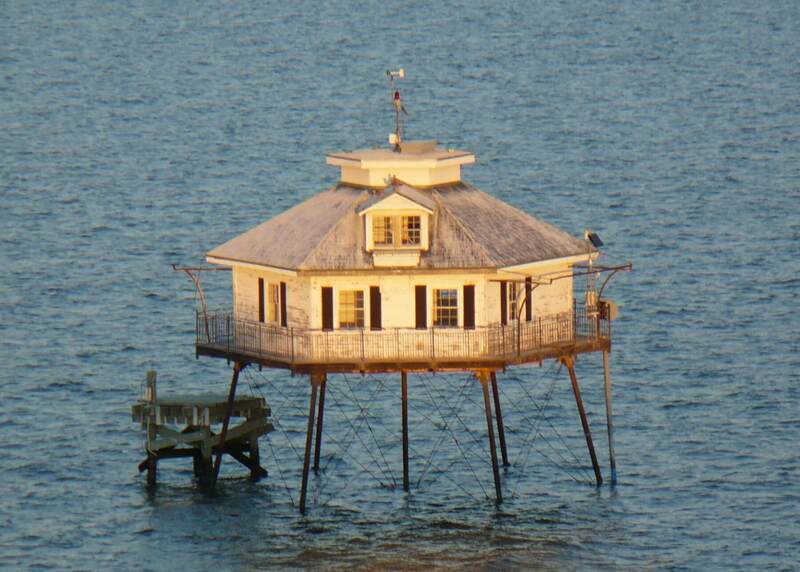 The hexagonal Middle Bay Lighthouse was first activated in 1885 and deactivated in 1967. In 2002, Thompson Engineering initiated a restoration effort under a $349,000 contract with the AHC. The project gave the lighthouse a new slate roof and replaced corroded tie rods and damaged wood. In 2008, the association published a proposal to move the Middle Bay Lighthouse ashore to Battleship Park. The AHC voted against the proposal, instead agreeing to spend $30,000 for yearly maintenance. 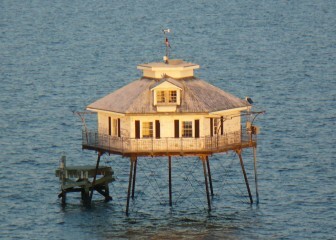 In 2011, the AHC began a $270,000 restoration of the lighthouse. Middle Bay is one of the few remaining “screw-pile” lighthouses still standing. Sand Island Lighthouse is roughly three miles out from the entrance to Mobile Bay, between Mobile Point to the east and Dauphin Island to the west. The lighthouse was constructed for $10,000 in 1837, destroyed eventually but reconstructed in 1873, then deactivated in 1933. Today, the 125-foot lighthouse is owned by the Dauphin Island Property Owners Association. According to the ALA’s summer 2015 newsletter, along with the rail repairs, roof repairs were also needed at Middle Bay after the April 25 thunderstorm that killed six boaters in the Dauphin Island Regatta. Winds blew slate off the roof in two sections. Pierce said he is concerned that smaller organizations like the ALA will get lost in a sea of high-dollar proposals from municipalities, counties and large organizations.